A few days ago I announced I have a new dog. She looks a lot like the picture, except there's no spots. She's pure light tan color, very nice, tight, tidy fur. Quite a bit different from what I had with my last dog, Underbrush, who was true to her name, being wildly furry. With Underbrush you never saw the same dog twice. The current dog, I'm seeing her over and over. I didn't announce the other day what her name is, but here it is, for your approval, Roughage. The name has some real meaning for me, which has to do with this. Roughage is the dog of my old age, and aging can be rough. I'm actually telling her she's the dog of my old age. Making her the only dog I've ever had that I believe might outlive me. That's bittersweet, because like any nice human being, I don't want my dog at her wit's end were I to die, wondering where I am. Plus, there's no one to take her if that happened. Although, of course, someone would probably step in and take her. So, depending on how rough my old age is, I might have to really work to hold on extra long, just to spare her the grief. Another good meaning for Roughage is it's sort of like the boy named Sue. In the song, the dad names his son Sue because he's not going to be there for him. And he knows if he's named Sue, he'll have to fight bullies so much he's more likely to survive. To which I say, "Thanks Dad! Sheesh! How about you just stay here and take care of me? Either that or next time keep your zipper up." 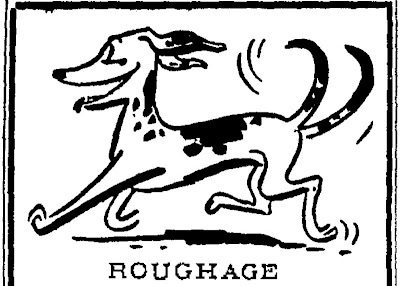 I'm not going to abandon Roughage, but if I die, of course she'll have to be rough with a name like Roughage. No bullies. Maybe other dogs wouldn't even get it, or other people. "What's your name, little one?" "Ruff! Ruff!" That's pretty good, assuming she won't ever be able to enunciate the second syllable. So she's the dog of my old age. Right now I'm 62 and Roughage is around three months old. In dog years three months is close to 2 years old, right? One year equals seven years for me, so it's conceivable she could catch up with me. Then we'll both be old together. Right now she's full of piss and vinegar, destroying stuff, chewing stuff, kind of a rascal. By then she'll be laying around and completely used to my routine, also laying around. My big gnarly paw will rest on her back as she snores away, and she'll be like in her momma's womb, that's how close we'll be. I don't know what will happen beyond that, except, as much as I want her to live forever -- like every dog -- it'll be a relief to me if she goes before me. That'll be it, then, no more dogs to worry about and take care of. But all those days are far away! Right now we'll still spry and having fun "getting to know you, getting to know all about you." Good old Roughage, currently 4.5 pounds of tight fur and wiggling muscle.